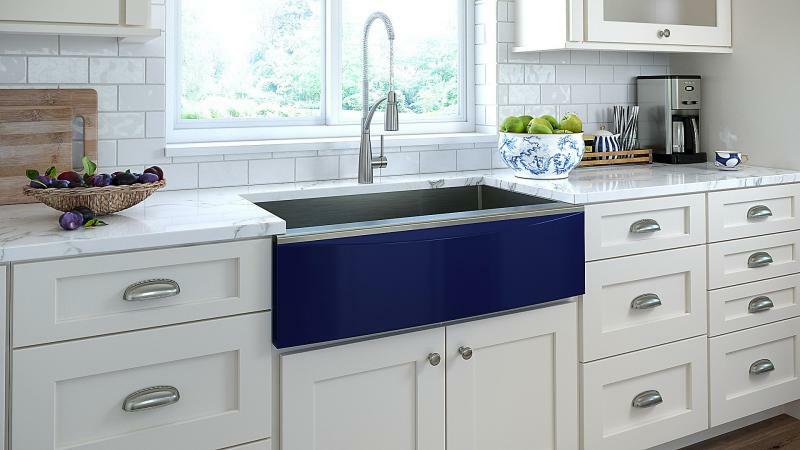 Lenova's NovaGranite sink is one of many farmhouse sinks on the market. Scroll down for more details. 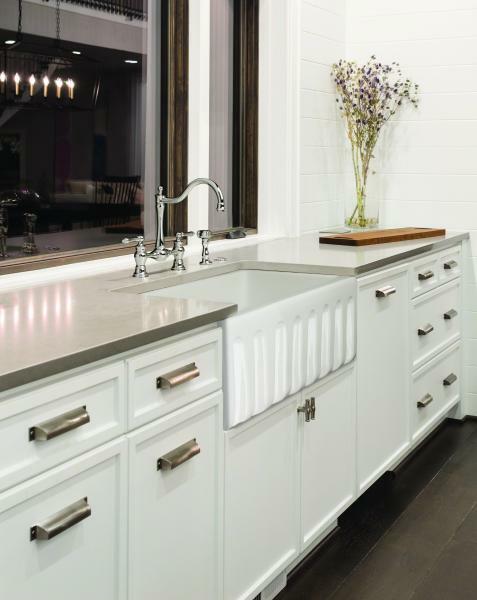 The NKBA’s latest trend report says farmhouse kitchens remain one of the most popular kitchen styles, meaning the apron-front sink won’t be going anywhere soon. What makes this trend such a mainstay in kitchen design? The answer can be found in farmhouse design’s versatility, giving it a timelessness that is familiar to homebuyers and owners. Farmhouse kitchens can be traditional or modern, but they always maintain a warmth that is appealing to many homeowners. 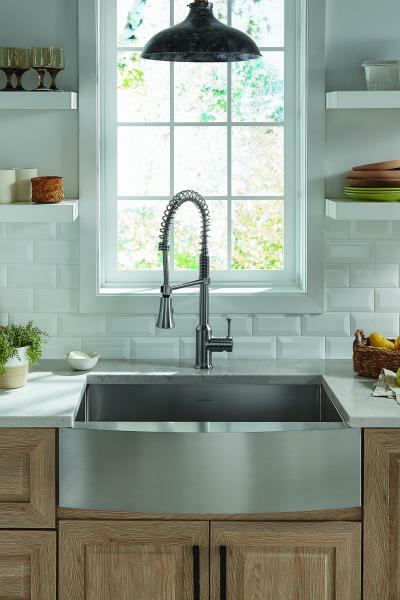 Traditional farmhouse sinks have been made fireclay, but these days it’s not unusual to see sinks made from stainless steel, cast iron, and other composite technology, making products more durable than ever. In addition to looks, manufacturers are adding new features to this style of sink that are making them workhorses in the kitchen. 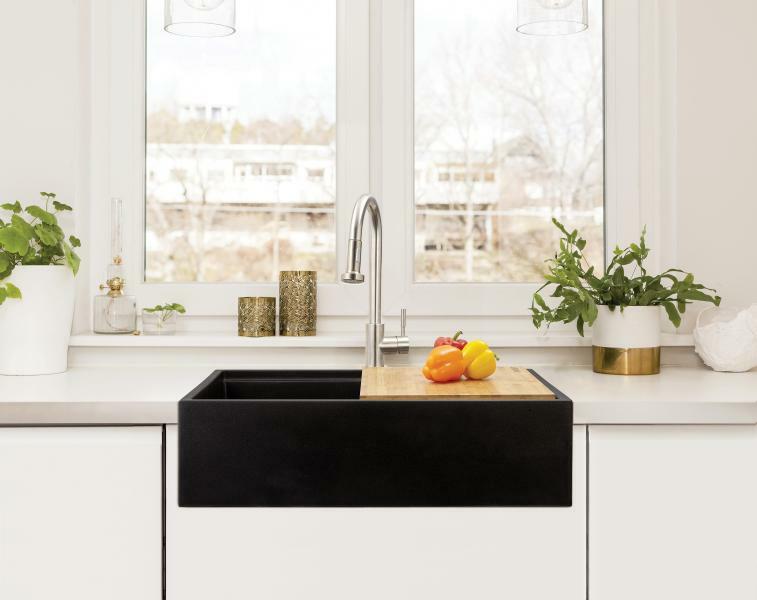 "New features like ledges molded in to the sinks offer more functionality than the traditional designs making the sink a food prep and clean up center," says Jay Beaumont, the director of sales and marketing for Lenova. Paired with a large volume, these sinks are increasingly equipped to take on kitchen chores. Here are nine new farmhouse sink options for your consideration. 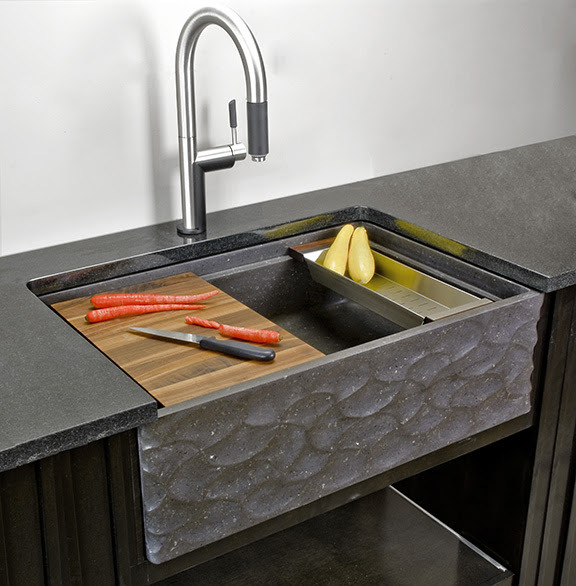 The NovaGranite Composite sink is made up the company’s high-density mix of 85 percent granite, plus organic material and binders. The result is durable and resists heat, scratches, chips, and stains, the company says. The 30-inch bowl is available in either white or black and includes a ledge system that can hold cutting boards, strainers, and racks. Ludington sinks target the e-commerce and builder markets with the popular style at an affordable price, the company, a subsidiary of Kohler, says. They are made from 18-gauge 304 stainless steel and come in a 34-inch by 19 ¾-inch size. The undermount body has a 9-inch depth and a center drain, and the saddle sits flush with the rim for easy cleaning. Sinks come with an optional strainer and silicone mat. The newest farmhouse designs from Stone Forest include the Wave Front (shown) and Basketweave sinks. The sink faces feature patterns carved in honed basalt and papiro cream marble, respectively. Both include a ledge to hold kitchen accessories such as colanders, trays, cutting boards, and drying racks, with wood accents in either maple or walnut. The bodies are ten inches deep and 33 inches wide. The new Pekoe apron-front sink is finished on three sides for installation flexibility. It also features the company’s SoundSecure+ rubber padding on the bottom and sides to minimize noise and vibration. The body is made from 18-gauge stainless steel and comes in 30- and 33-inch sizes. It includes a drain, strainer, and protective grid. 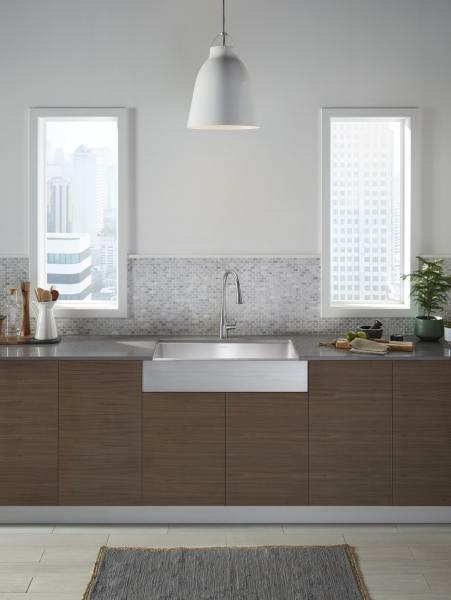 The Cerna II fireclay apron-front sink features a reversible design with two corner shapes, giving the homeowner a choice between traditional or contemporary curves. The durable surface is fired at 2,100 degrees F. It is available in 30- and 33-inch sizes in either white or biscuit, and comes with a protective grid. The newest Crosstown stainless steel sink supports interchangeable apron fronts that can be changed without removing the sink. They come in a number of styles, including colored stainless steel and white fireclay. The body is made from 16-gauge, Type 304 stainless steel and features straight walls, a flat bottom, and an offset drain for maximum usable space, the company says. It will be available in September 2018. 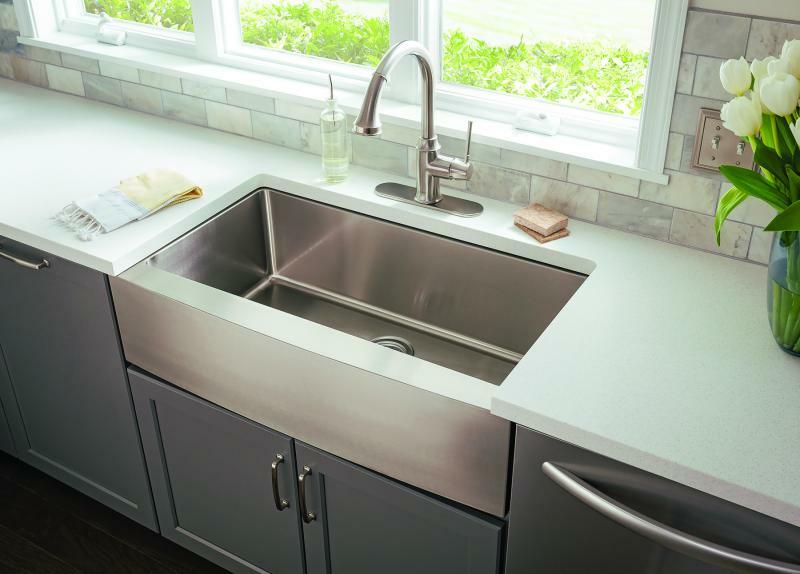 The manufacturer’s Premium Handmade stainless steel sinks are hand-bent and -welded and include reinforcement plates and insulation for durability and sound-dampening. The body is 33 inches wide with a 10-inch depth and 15 millimeter-radius corners. All kits ship with mounting kits and templates. 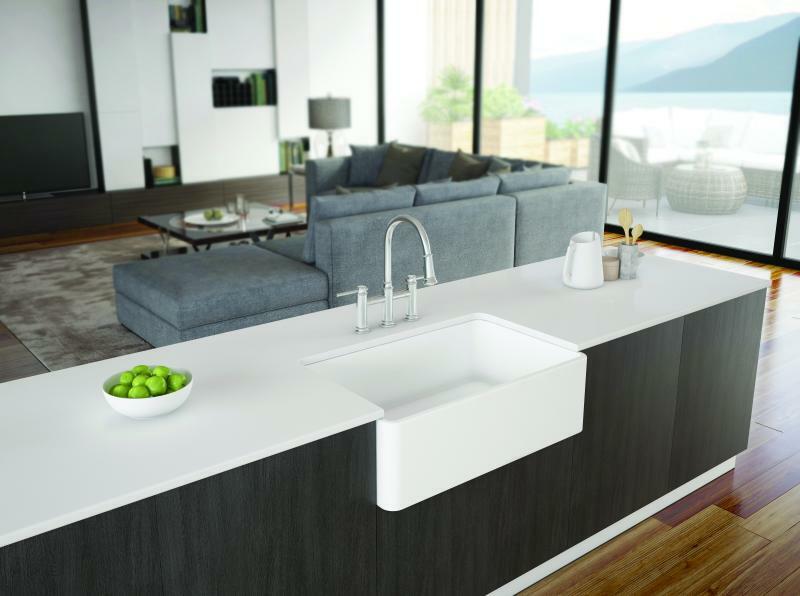 Bocchi has added a step rim option to its Contempo (shown) and Vigneto apron front sink collections. The ledge can hold a strainer, colander, and wooden cutting board to maximize kitchen work space. Sinks also come with a protective bottom rack. Both models are made of smooth, non-porous fireclay.